The registration fee includes luncheon, receptions, refreshments, networking breaks, continental breakfast, and original course materials. Payment is required in advanced and can be made by company cheque, VISA, MasterCard, or American Express. Please make cheques payable to the Strategy Institute Inc. and write the registrant’s name on the face of the cheque. A Group Discount is offered for this conference (not in combination with any other offer). To be eligible for the Group Discount, delegates MUST register at the same time. 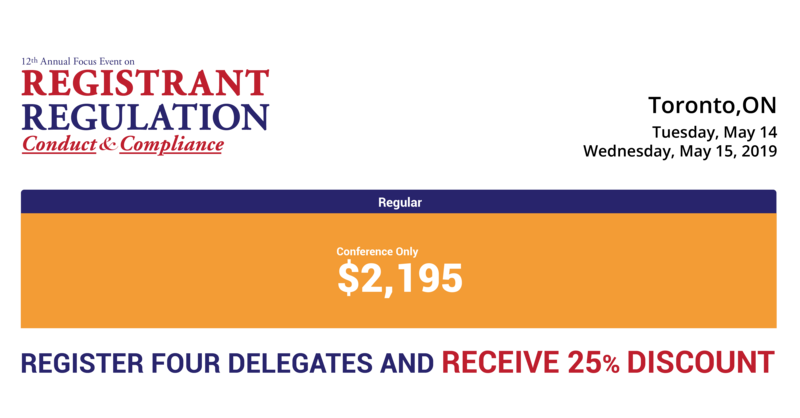 The total discount per delegate (including applicable group discounts, etc.) MUST not exceed 25% of the regular conference cost. VIP Discount codes are valid for new registrations only (cannot be combined with any other offer). VIP Discount code must be presented at the time of registration. The registration fee includes luncheon, receptions, refreshments, networking breaks, continental breakfast, and original course materials. Payment is required in advance and can be made by company cheque, VISA, MasterCard, or American Express. Please make cheques payable to the Strategy Institute Inc. and write the registrant’s name on the face of the cheque. Expires on December 14, 2018, and January 18th, 2019. Cannot be used with group discount. If you would like to register a group, click the ‘Add Delegate’ button below. Please select a 'Registration Type' for each additional delegate. Please note that the type of registration needs to be the same for all registrants. * For groups of 4 or more attendees please enter the VIP code Group25 to receive a 25% discount. Cancellations: Cancellations must be received in writing by May 1st, 2019. Cancellations received by this date will be eligible for a prompt refund less a $495.00 administration fee. If you register for the program and do not attend, you are liable for the full registration fee unless you cancel according to the terms stated above. If you are unable to attend, delegate substitution is permitted up to, and including, the day of the conference. Expires March 31, 2019. Cannot be used with a group discount. Legal Disclaimer: Strategy Institute reserves to itself the right to restrict entry to the conference to any individual. Any such person requested to leave the conference site shall do so immediately on request, whether previously issued a badge permitting entry. There is no refund payable with respect to anyone refused entry. Any information obtained at the conference cannot be relied upon for any particular set of circumstances, cannot be taken as professional advice or opinion and that attendees must consult with the appropriate professional before acting in response to information obtained at the conference. Evening Social Activities - You are responsible for own consumption costs. Please drink responsibly. Strategy Institute shall not be liable for any consequential damages and/or personal injuries caused by excessive or irresponsible alcohol consumption. Strategy Institute is not liable for any additional charges levied by a credit card company / bank, including but not limited to American Express currency conversion charges.